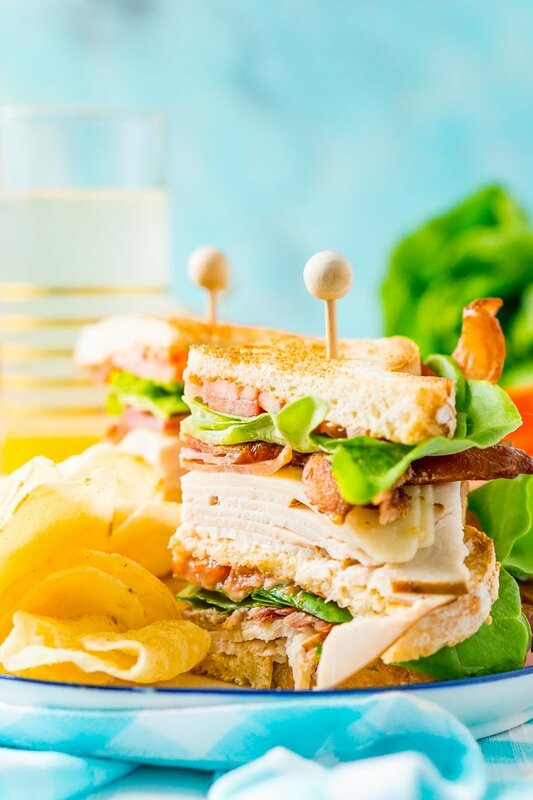 This Club Sandwich Recipe is an easy and classic sandwich made with hickory smoked turkey breast, Swiss cheese, thick-cut bacon, lettuce, tomato, and mayonnaise. It’s a great lunch or light dinner recipe! When it’s finally summertime in New England, it’s important to enjoy every second of sunshine that we can! That’s why Matt and I have been enjoying these delicious Club Sandwiches for leisurely weekend lunches on the patio. 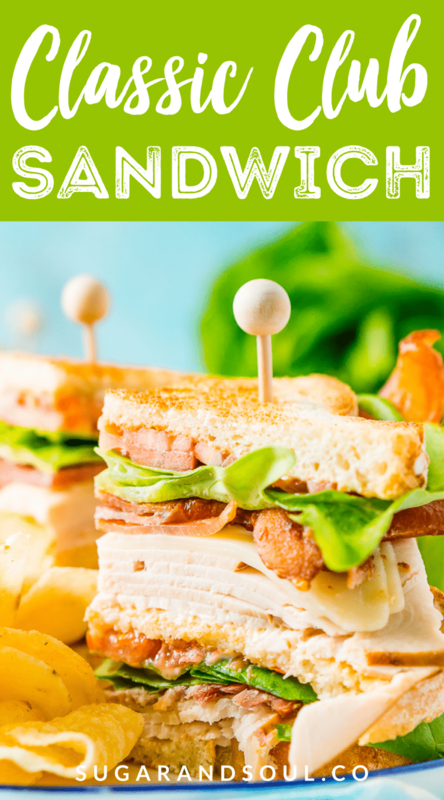 Easy, tasty, and portable, these layered sandwiches are perfect for boxed lunches, beach coolers, or picnics! In this recipe, thick-cut bacon, crunchy lettuce, juicy tomato, tangy Swiss cheese, and tender turkey are piled onto toasted white bread with a dollop of mayo. The secret to making a simple recipe truly great is to use top-quality ingredients, which is why I always use McKenzie Natural Artisan Deli Hickory Smoked Turkey Breast in my Club Sandwiches. Available at Shaw’s stores throughout New England, you can choose from several different varieties that are roasted, smoked, seasoned, or flavored with a touch of maple and honey. Located in Burlington, Vermont, this company has been crafting top-quality meats and cheeses for over 100 years. Aside from its mouthwatering taste, I choose McKenzie products because they’re naturally made without hormones or antibiotics. 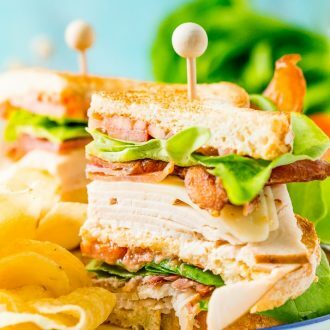 You may find yourself making this crowd-pleasing Club Sandwich recipe to bring on all your summer adventures. Whether you and the family are poolside, beachside, hiking, or just out on the deck, this lunch is portable and so yummy! I love having picnics as an easy, inexpensive way to get out of the house and enjoy good food, good weather, and good company. In my opinion, the perfect picnic basket should include something crunchy, something savory, something sweet, and a few wholesome sandwiches to share. In today’s fast-paced and technology-filled world, it’s important to slow down once in awhile and enjoy the simple things in life. 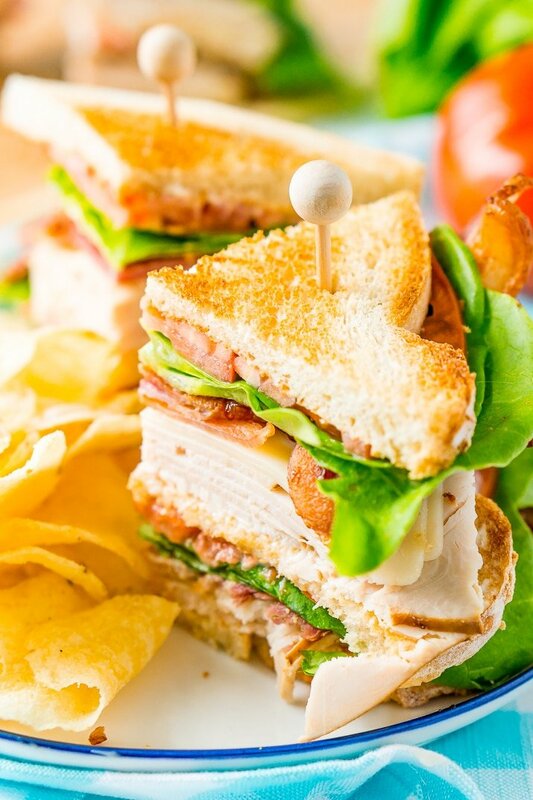 A classic turkey Club Sandwich, a handful of chips, and a glass of lemonade make a satiating summertime lunch — especially if it’s enjoyed under a tree on a checkered blanket! Don’t get me wrong, there’s no bad time to enjoy a Club Sandwich made with McKenzie Natural Artisan Deli turkey. Pack one for the kids as part of a healthy school lunch, or for yourself so you don’t have to buy food while you’re at work. Make memories this summer by enjoying the great outdoors, and bringing along some turkey Club Sandwiches. Whether you’re picnicking in the park, at the beach, or your own backyard, sandwiches made with McKenzie turkey make the perfect lunch, now and all year round. 1. High-Quality Meat and Cheese – I’m a firm believer that a sandwich is only as good as it’s ingredients, that’s why I use McKenzie Artisan Deli meats. I love the smokey flavor their Hickory Smoked Turkey Breast adds to my club sandwiches, but you could use any of their other varieties if smokey isn’t your style. I also prefer Swiss cheese, but cheddar will do just fine too! 2. Heirloom Tomatoes – I know there are a lot of different kinds of heirloom tomatoes, so feel free to choose your favorite, but I think Heirlooms have the best flavor and make for great sandwich tomatoes because they’re so tender and easy to bit through and a great size for slicing. 3. Thick-Cut Bacon – There nothing more disappointing than a thin slice of bacon, so go for the thick stuff and load it on to add some delicious salty flavor to your sandwich! 4. Butter Lettuce – You can use whatever lettuce you have on hand, but if you’re going out and buying some, I highly recommend getting this variety. I love the flavor and think the leaves are perfectly sized and flavored for sandwiches. 5. Mayonnaise – In my opinion, mayo is the only thing that should be used on a Club Sandwich, the rich fattiness makes all the difference and really brings those fresh veggies and delicious meats and cheeses together. I recommend putting it on the inside of the top and bottom slices and both sides of the middle slice of toast for best flavor! 7. Salt and Pepper – Now, I know it’s just salt and pepper, but it really adds a lot even if you just add a little. 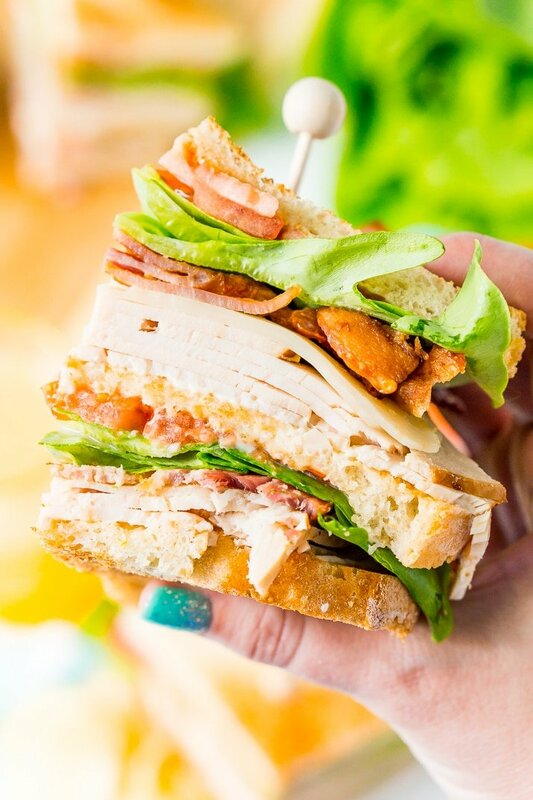 Pin this Turkey Club Recipe for Later! 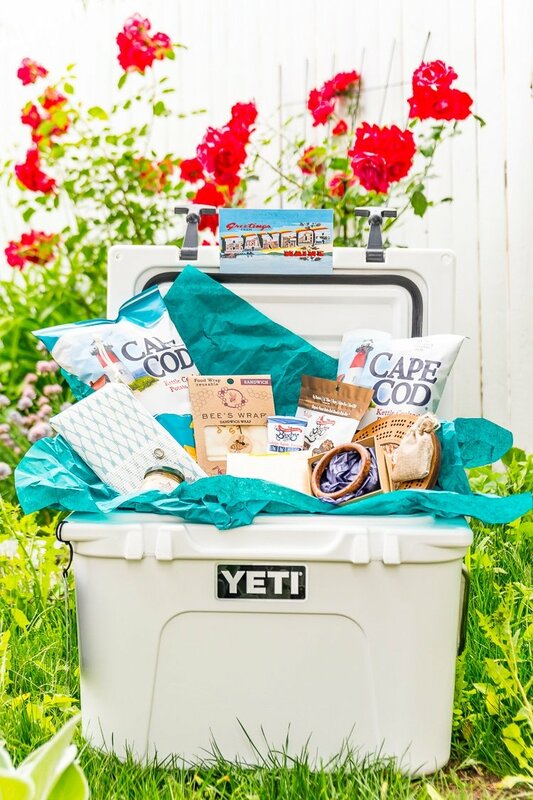 Oh, and did I mention I have a super fun giveaway going on over on Instagram right now where you can win this Yeti Cooler filled with some of my favorite New England foods and Artisan goodies? It’s valued at over $400.00 and I’d love for you all to pop on over and enter to win! New England YETI Cooler GiveawayEnter Now! 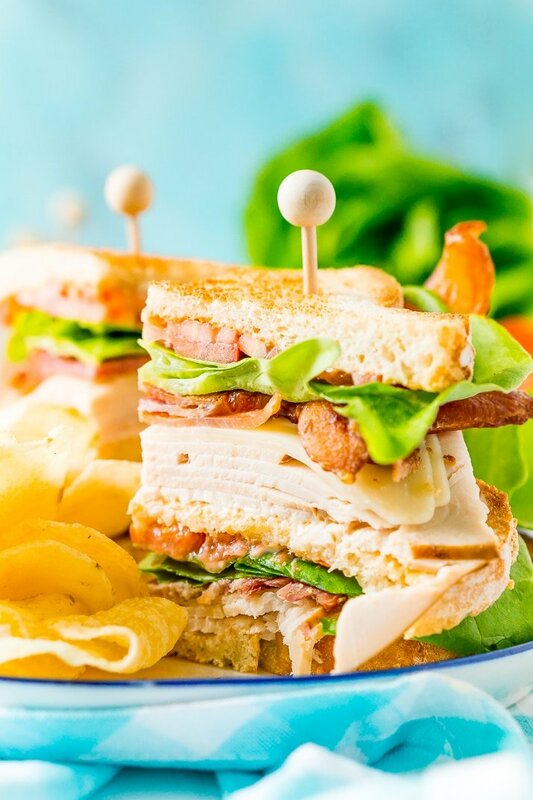 This Club Sandwich Recipe is an easy and classic sandwich made with hickory smoked turkey breast, Swiss cheese, thick-cut bacon, lettuce, tomato, and mayonnaise. Toast the bread and place one slice on a cutting board or large plate, spread mayonnaise on the side that is face up. Place two slices of McKenzie Artisan Deli Turkey Breast on top of the mayo, followed by a slice of Swiss cheese and 3 slices of bacon. The top with 3 leaves of butter lettuce and two slices of tomato. Add salt and pepper, if desired. Spread mayonnaise on another slice of the toast and place it mayonnaise slide down on the tomatoes, then spread mayonnaise on the other side and repeat the layers. Finishing with the last piece of toast spread with mayonnaise on one side. Use 4 sandwich picks to pin the sandwich together, then use a large sharp knife to cut the sandwich into triangles before serving. This makes a very big sandwich and is enough to split between two people. Oh wow, this is my kind of sandwich!! Perfect for a summer lunch!